Ever since son is done with his exam, he is basically living in either his bed or on the couch! I am sure, by now, you know what is that magnetic force is, that actually glued my hyper-active son to be able to sit down for hours! It is that damn PHONE and his PSP! Yes, these days, kids evolved around gadgets so much into their life that they can't live without them! They lacked the social skill, they lacked the communication skill and they lacked all skills that deal with human! The standard of communication got lost in the lingo that me, this generation finds it hard to comprehend. They don’t seem to be able to form thoughts and feelings into one proper sentence anymore. Though my son loves to read, his English was never powerful! He doesn’t even know that you need to begin with Capital letter after a Full Stop! Unbelievable isn’t it? One might question, why in the first place I provided those gadgets! I was once told off by a “so called good friend” that if I deprived my child from material stuff, he will end up stealing! To date, I still stood firm my belief whether a wants and needs for my child. I refused to supply my kids with the latest gadgets or material things. I need to teach my child the values rather than succumb to peers’ influence. Well, to cut long story short, the phone was intended for communication between him and me. Unfortunately, with the advance technology, it is hard to find a basic phone with the standard phone subscription. Thus the list of promises NOT TO DO was signed on the dotted line. Then again, the phrase "promises are meant to broken" exists in son's dictionary and that becomes a challenge. As for the PSP, it was a gift by my sister to reward him for doing well in his PSLE. Luckily, this was only available during school holiday and now after exam. Enough said, I am really tired of dealing with this. He better pray that he won't exceed his sms quota this month, if not, it will leave me with no alternative but to have his phone grounded again! Since I can't get my son off those couch, I managed to get my hubby and girl to help me with lunch today. Girl was helping me with the crust pastry while hubby was grating the cheese. I had wanted to bake an Onion Tart for the longest time. 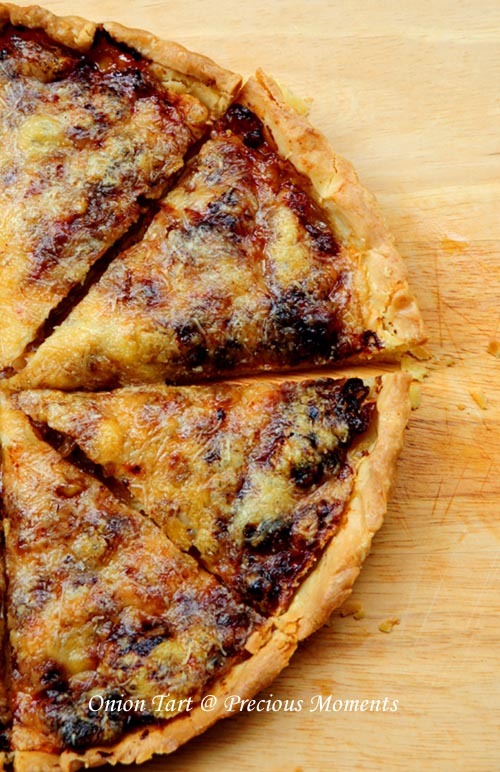 I was totally blown away by SY's onion tart that she bought to my house last year. Unfortunately I didn't manage to get her recipe and thus I lifted one off the internet. My girl and I love it! It was sweet and tasty. The gruyere cheese really blends very well with this recipe. I like the crust too. Next was the Smoked Salmon Quiche. The smoked salmon was a gift from LT's NZ trip. Didn't really know how else to eat it and thus I turned it into a Smoked Salmon Quiche. After all, I never attempt on Quiche before. KW also came by to give me some plants and I invited him for lunch. Seems like the boys all preferred the Smoked Salmon Quiche! Personally, I think I can still improved on this. Son commented a little salt will be perfect. Overall, we had a very filling lunch and all of us are happy and guess what, my little one is so proud of herself for helping to prepare lunch. Seriously, I don't know what will happened to our next generation. How can they present themselves globally? These tarts are also my first and totally enjoyed it. This tarts look SO good! About that phone thingy, we have limited plans for my girl, no 3G and all that. No motivation to use it. She says most of her friends have the e gadgets as an extension of their nervous system! Bake yourself, it is not that difficult. I love tarts and quiches! 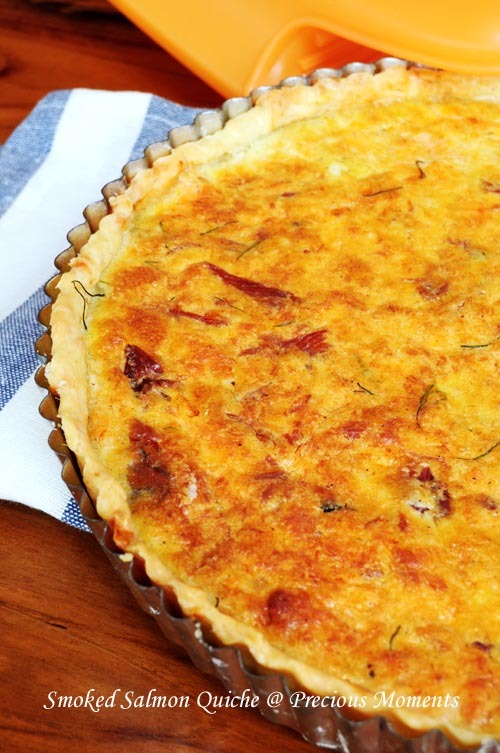 Both your onion tart and salmon quiche looks so delicious!